← Is your Mobile Web Site Google Ready ? 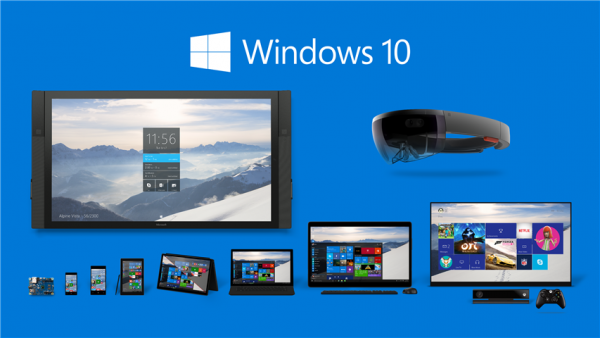 This is the target Microsoft has set for its latest operating system Windows 10. Windows 10 which we will see released to the public in the coming months is the first in a radical change in the design and philosophy that was once Microsoft. Firstly this will presumably be the last time a Windows operating system has an official name, as from this version on Microsoft intends to implement more upgrades more often. This will see the operating system progress not unlike that of Apples IOS. Microsoft has seen the light, well maybe not the light but the dollar signs. Gone are the days whereby applications and hardware had to be compatible with Microsoft. Microsoft has promised developers and consumers that Windows 10 will be a single platform on which to run all their apps across all their devices. Developers will write a single base code, creating universal apps that work on any device including phones, tablets, PCs, the Xbox One game console, TVs, ATMs and even the new HoloLens virtual-reality headset. King, the developer of Candy Crush Saga, has already utilised these technologies to bring their wildly popular game to Windows Phone. This move by Microsoft provides developers of Andriod and IOS apps to the Windows market and its devices. But more importantly it provides developers of .NET and Win32 access to the complete suite of devices to run or enhance their applications.